Last week saw the latest volley in the escalating “smart-phone war” as the United States International Trade Commission (ITC) ruled that Apple did not infringe an HTC patent. The ITC determined that no violations occurred and closed the case, ending a May 2010 suit alleging infringement of five patents. Here, the final HTC patent in question taught methods for power management of a smartphone, illustrating methods of managing “PDA sub-systems” (e.g., apps) while other systems (e.g., calls/texts) are active, and vice versa. Although Apple certainly does have power management systems on its smartphones, the ITC investigation held that the specific algorithms differ from those disclosed by HTC. A detailed blow-by-blow account of the investigation can be found in a recent Foss Patents blog post. Unfortunately for HTC, this ruling does alter a prior ITC decision, boycotting the importation of certain HTC devices into the USA. A casual reader may ask why HTC filed this complaint with the ITC instead of a US District Court. The most likely reason is time, as ITC decisions are expected in roughly 16 months as opposed to 2+ years in District Court. The downside: the ITC can only award an injunction on importing/exporting products, whereas district courts can award damages. That said, the ITC’s decision may be persuasive in subsequent district court decisions. Many companies in HTC’s position would calculate that the potential of increased future repeat customers outweigh the potential damages, which are often based on the number of infringing devices actually sold. When comparing smartphones, many consumers not only place a high value on the user interface, but tend to favor interfaces they are familiar with. Companies like Apple and HTC know this, and therefore try to stake a claim in features that set their devices apart from the crowd. What better way to do this than with patents, which provide strong protection and can be enforced internationally. Patents, as opposed to copyright or trade secrets, provide some of the strongest intellectual property protection. Copyright merely protects the “expression of an idea,” but only to the extent that others cannot copy an original author. An independent creator of the same idea is equally entitled to copyright protection. What this means for a software-copyright holder is that if someone else either comes up with an alternative method of achieving the same functionality, or independently creates the same product, the original copyright holder must share the market space with the subsequent inventor. Trade secrets are similar with the additional caveat that if another company independently engineers similar or identical software, the later inventor could actually patent the invention, barring the first inventor from producing the software. This could occur if the subsequent invention occurs prior to “the invention [being] made in this country,” under 102(g)(2). However, once the invention is commercially available, even if it is secretly commercialized, subsequent inventors are barred under 102(g)(2) and potentially under 102(b). As smart phone companies work to distinguish themselves from one another, these patents become more and more valuable, providing strong protection through robust rights to exclude as well as the potential for lucrative licensing. These economics are not lost on the industry giants, each of which has a notable arsenal of patents (Google will soon increase its portfolio with its recently approved acquisition of Motorola Mobility). Naturally, as companies both increase their stock of patents and converge on each other’s good ideas, infringement is bound to occur. It can be tough to appreciate the complexity and volume of these suits. Last September, the Foss Patents blog mapped the ongoing battle between Apple and HTC in a presentation, the first 22 slides of which outline a plethora of suits and countersuits spanning four different courts. Although I won’t go into detail here, it is easy to see that even between two companies (three if you count S3, an HTC subsidiary), the litigation can quickly escalate. Stepping back and looking at the industry as a whole, simply keeping track of all the suits is a full time job. Just last week, Apple made patent headlines on three occasions,  it’s win over HTC at the ITC covered above,  a setback in a German court, and  a recent patent infringement filing against Samsung in a California District Court. How will it all play out? It is tough to say. An example of another recent “patent war” is in the implantable medical device industry, wherein big hitters such as Medtronic, Boston Scientific, and St. Jude Medical went head-to-head. In the end, as costs escalated and companies elucidated patent portfolio strengths and weaknesses, a series of cross-licensing agreements and payouts occurred. Although the future is tough to predict, it would appear that the rate of technological change (and thus new patents) would make litigation at this scale unsustainable for the smartphone industry. Then again, as smartphone use increases globally, especially in emerging markets, the costs of litigation are increasingly justified. This patents “arms-race” may just be the tip of the iceberg! According to BBC News today, Apple have succeeded in the German courts in enforcing a patent for a user interface feature for their mobile devices. The ruling exemplifies the value of European patents for “software” inventions where a “technical” effect can be demonstrated. The claims in the granted patents and the problems that they solve provide useful insight as to what features of a user interface might be regarded as “technical” by the EPO. The advantages to a software developer of being able to patent innovative interface features of this type are self-evident. 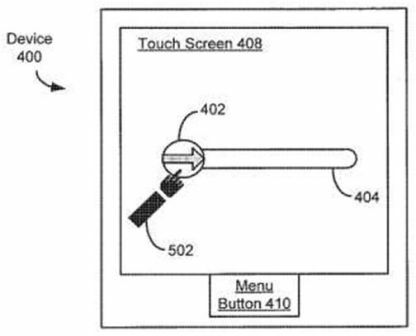 moving an unlock image along a predefined displayed path on the touch-sensitive display in accordance with the contact, wherein the unlock image is a graphical, interactive user-interface object with which a user interacts in order to unlock the device. A copy of the decision is not yet available online, but study of the online file of the patent application (which was not opposed after grant) is instructive. The Examining Division accepted that the provision of a device control method with visual feedback was a technical problem but objected that the claimed subject matter was obvious because dragging and dropping were known. In their reply, Apple argued that the objective technical problem was to provide a more efficient user-friendly procedure for unlocking a portable device and to provide a sensory feedback to the user regarding progress towards satisfaction of a user input condition that was required for unlocking to occur. As set out in the claim, the unlock image signalled to the user that the device was locked and simultaneously indicated a contact point that a user had to touch in order to unlock the device. The displayed path indicated to the user where and how the unlock image had to be moved and the current position of the image indicated progress already made towards the unlocked condition. The method was easier than in the prior art where a sequence of operations had to be memorised. The second patent, EP-B-2059868 which relates to the handling of digital images, has not yet been ruled on by the German courts. However, the granted claim and the reasons for grant are also of interest especially since any iPhone user will be familiar with the “Camera-Roll” feature in question. The main claim is set out below. in response to detecting the second movement while the previously hidden edge of the first digital object is displayed, translating the first digital object in the first direction and displaying a second digital object in the set of digital objects. It appears from the file of the granted patent (which again was not opposed) that the technical effect of allowing a user to navigate within an image and to switch between images with a minimum of user input types was sufficient to support patentability. The EPO acted as International Searching Authority, International Preliminary Examination was not necessary since the written opinion accompanying the search was favourable to patentability, and no objections were raised on entry into the European regional phase. For applications where allowable subject matter is likely to be identified, the advantages to US applicants of using the EPO as ISA (and possibly subsequently IPEA) are also self-evident. We introduced Dealertrack, Inc. v. Huber (“Dealertrack II”), a U.S. Court of Appeals for the Federal Circuit (the “CAFC”) decision, in a post on January 27. That post provides an overview of the case and discusses CAFC’s Section 101 patent eligibility analysis. This post will discuss CAFC’s de novo claim construction review. Dealertrack II at 9. Dealertrack’s invention relates to automating the process by which car dealers seek loans on behalf of their customers from one or multiple funding sources. Id at 3. Dealertrack sued David L. Huber and Finance Express, LLC and RouteOne (the “Defendants”), claiming that each of their various competing products infringed, among others, U.S. Patent No. 6,587,841 (the “’841 Patent”). Id. at 4. The district court granted summary judgment of noninfringement of all asserted claims in the ‘841 Patent. Id. at 5; see also Dealertrack, Inc. v. Huber, No. CV-06-2335 (C.D. Cal. Sept. 27, 2008) (“Dealertrack Claim Construction”). In reversing, CAFC explained that a list of examples in a patent specification is typically not considered exhaustive. Further, it explained that a contextual analysis that focuses on internal consistency throughout the patent is required to determine whether i.e. is used in an exemplary or definitional manner. But CAFC gave with one hand and then took with the other. It then reversed the district court’s denial of summary judgment of invalidity for indefiniteness on some of the asserted claims. Here, CAFC’s analysis should serve as a warning to those drafting means-plus-function claims in software patents. CAFC reviewed the construction of the terms communications medium, routing, selectively forwarding, and central processing means. Claim 7 demonstrates the use of these terms, except for central processing means. Id. at 6–7 (emphases added by CAFC). Claim 14 demonstrates the use of central processing means and is included later in this post. “The district court construed ‘communications medium’ as ‘a network for transferring data, not including the internet.’” Id. at 10 (quoting Dealertrack Claim Construction at 19). Because each of the asserted claims included a communications medium and the accused products all pass communications through the Internet, this construction was fatal to Dealertrack’s infringement claims. See id. at 10. The district court’s decision rested on this language from the specification: “Although illustrated as a wide area network . . . , it should be appreciated that the communications medium could take a variety of other forms, for example, a local area network, a satellite communications network, a commercial value added network (VAN) ordinary telephone lines, or private leased lines.” Id. at 10 (quoting ’841 Patent col.17 l.67 – col.18 l.5). The district court reasoned that while “it is improper for a court to limit a patent to its preferred embodiment, it is reasonable to assume that when a patent supplies a long list of examples like here, the list is exhaustive.” Id. at 10 (quoting Dealertrack Claim Construction at 18). CAFC was not persuaded. Instead, it recognized that “[t]he disclosure of multiple examples does not necessarily mean that such list is exhaustive or that non-enumerated examples should be excluded.” Id. at 12. CAFC concluded that “the only reading that does not violate this court’s repeated prohibition against importing limitations from the specification, is of a non-exhaustive list.” Id. at 13. It further noted that the specifications also said that “[t]he communications medium used need only provide fast reliable data communication between its users.” Id. at 13. And this, along with the list of examples, “if anything, broadens the definition of ‘communications medium.’” Id. at 13. CAFC determined that a communications medium was a “network for transferring data,” and that the Internet would have been consider as such a network, even in 1995, the priority date of the ‘841 Patent. Id. at 3, 13. The court was not persuaded by Defendants’ argument that in 1995 “the Internet was not reliable.” Id. at 15. It noted that an “ambivalent statement” about reliability from Defendants’ expert witness was “insufficient to show that ordinary artisans would have considered ‘communications medium’ to exclude the Internet.” Id. at 15. CAFC affirmed the district court’s construction of the term routing as “[s]ending or forwarding by a particular route.” Id. at 16, 21. In doing so, it rejected Defendants’ proposed construction of routing: “Sequencing (order) and timing.” Id. at 17. Defendants “argue[d] that the patent twice defines ‘routing’ as ‘sequencing (order) and timing’ in describing the preferred embodiment.” Id. at 17. For example: “As already mentioned, the present invention provides flexibility in funding source selection, and routing, i.e., sequencing and timing.” Id. (quoting ‘841 Patent col.22 ll.46–48) (italicized emphases added by CAFC). CAFC pointed out that “contextual analysis” was required to “determin[e] whether the patentee’s use of ‘i.e.’ was definitional.” Id. at 20. The court cited multiple other places the patent used “i.e.” to cite examples. See Id. at 20. The court also pointed out that sequencing was unnecessary when only a single funding source was selected. Id. And since the claims used the term routing with only a single funding source, “[t]he only way that the ‘i.e.’ in this patent could be read definitionally is if it excluded from the claim scope the embodiments discussed throughout the claim where only a single funding source is selected.” Id. CAFC concluded that “internal consistency can only be achieved by reading ‘i.e.’ as exemplary.” Id. at 21. CAFC also affirmed the district court’s construction of the term selectively forwarding as “[f]orwarding to particular (i.e. ‘selected’) destination(s)” Id. at 21, 38. In doing so, it rejected Defendants’ proposed construction of selectively forwarding: “Forwarding using a selected sequence (order) and timing” Id. at 21. Defendants argued that because the ’841 patent “show[s] a preferred embodiment having three possible ‘[r]outing selections’ for sending a credit application to multiple lenders,” selectively forwarding “should be construed such that the claims require a user to select one of multiple such routing schemes, excluding methods and systems that permit only one routing selection scheme.” Id. at 22 (italicized emphases added by CAFC). CAFC first noted that “it is improper to read limitations from a preferred embodiment described in the specification—even if it is the only embodiment—into the claims absent a clear indication in the intrinsic record that the patentee intended the claims to be so limited.” Id. at 22 (quoting Enzo Biochem, Inc. v. Applera Corp., 599 F.3d 1325, 1342 (Fed. Cir. 2010), cert. denied on other grounds, 131 S.Ct. 3020 (2011)). After a review of the claims, CAFC declared “[b]y specifically and separately claiming each of the disclosed routing schemes in different claims, and by using the term ‘selectively forwarding’ in those claims, the patentee made clear that he intended at least some of the claims to cover embodiments that implement only one of the routing schemes.” Id. at 23. Central Processing Means . . . For. wherein said central processing means computer program which implements and controls credit application processing and routing, further provides for tracking pending credit applications. Id. at 7–8 (bolded emphases added by CAFC) (italicized emphasis added). With a means-plus-function claim, “the patentee is allowed to claim a limitation in broad functional language, ‘provided that the specification indicates what structure constitutes the means for performing the claimed function.’” Id. at 26 (quoting Biomedino, LLC v. Waters Techs. Corp., 490 F.3d 946, 948 n.1 (Fed. Cir. 2007)). The district court determined that the structure for performing the claimed function was a “mainframe, super-mini or minicomputer system, and a database,” id. at 26, apparently looking to col. 18 ll. 10-11 of the ‘841 Patent. Upon review CAFC noted that “[t]he indicated structure must limit the claim so as not to allow pure functional claiming.” Id. at 26. And that “[f]or a patentee to claim a means for performing a particular function and then to disclose only a general purpose computer as the structure designed to perform that function amounts to pure functional claiming.” Id. at 25 (quoting Aristocrat Techs. Austl. PTY Ltd. v. Int’l Game Tech., 521 F.3d 1328, 1333 (Fed. Cir. 2008)). “Therefore, ‘in a means-plus-function claim in which the disclosed structure is a computer, or microprocessor, programmed to carry out an algorithm, the [corresponding] structure is not the general purpose computer, but rather the special purpose computer programmed to perform the disclosed algorithm.’” Id. (quoting Aristocrat, 521 F.3d at 1333) (alteration in original). CAFC held that the proper construction of central processing means was thus “[a] main-frame, super-mini, or minicomputer system, with an operating system and a computer program on a computer readable storage medium for executing the specific algorithms disclosed in [the specification]” Id. at 24; see also id. at 27. It further clarified that to infringe the ‘841 patent, the accused product need only implement one, not all, of the disclosed algorithms. Id. at 27. Finally, CAFC held that the disputed claims were invalid due to indefiniteness. It noted that the function of the means-plus function claim included “tracking pending credit applications.” Id. at 29. But “the ’841 Patent’s specification discloses no algorithm pursuant to which the ‘central processing means’ could perform the claimed function of ‘tracking.’” Id. CAFC then held that Defendants were entitled to summary judgment of invalidity for indefiniteness. Id. CAFC used a common sense approach in its de novo claim construction review. It rejected the defendant’s narrow interpretations of routing and selectively forwarding by construing these terms in a manner that retains internal consistency with the rest of the patent. It also dismissed the defendant’s fanciful argument that the Internet is not a communications medium by reaffirming that a list in the specification should, generally, not be considered exhaustive. Careful drafting may have avoided these arguments altogether. It is, however, nice to see that the plain language meaning of a patent will be favored over spurious arguments. CAFC also reaffirmed the holding in Aristocrat that a means-plus-function claim must be supported by adequate structure in the specification. This is a good reminder to consider carefully whether to use such claims. If you do chose to include a means-plus-function claim, make sure that the specification provides structure for every element of that claim. 26. A computer-readable [storage] medium [storing] one or more sequences of instructions which, when executed by one or more processors, causes the one or more processors to perform the method recited in claim 1. U.S. Patent Publication No. 2006/0101033A1 (Published May 11, 2006) (Amendments from Nov. 22, 2007 shown in brackets). Decision: Claim allowed. “We find that the computer-readable storage medium is directed to a tangible storage medium, which can be read by a computer. While a computer-readable medium is broad enough to encompass both tangible media that store data and intangible media that carry a transitory, and propagating signal containing information, a computer readable storage medium is distinguished therefrom as it is confined to tangible media for storing data. Therefore, because the cited claims are limited to a tangible medium within one of the four statutory classes of 35 U.S.C. § 101, they are directed to statutory subject matter.” Ex Parte Hu, No. 2010-000151 (B.P.A.I. Feb. 8, 2012) at 4 (emphasis added). Tip: A computer-readable storage medium is considered non-transitory. using the patterns with assigned attributes to analyze the query sequence. Ex Parte Rigoutsos, No. 2009-010520 (B.P.A.I. Feb. 7, 2012) at 2. Decision: Claims rejected. “Claims are directed to a method for annotating a query sequence, which does not qualify as a patent eligible process under 35 USC § 101 . . . .” Id. at 3. The claimed method is not tied to a particular apparatus and the language is “broad enough to encompass a manual method by a user.” Id. at 9. Additionally, there is “no transformation expressly set forth.” At most, the claim “recites adding additional data to other data without expressly setting forth any of the specifics of the process.” Id. at 10. Tip: Limit software process claims to computer implementations and/or be explicit in claiming a transformation (e.g., a method for transforming a query sequence into an annotated query sequence . . . .). issuing from said rollup entity to said at least one recurrent yield monetary asset resource said calculated number of shares of said financial derivative instrument. Ex Parte Edelson, No. 2011-004285 (B.P.A.I. Feb. 6, 2012) at 7. Decision: Claim rejected. “[C]laim 11 performs no physical transformation and does not recite how a specific machine is used, and therefore recites no more than an abstract idea.” Id. at 8. “Claim 11 does no more than lay out the concept of issuing a derivative instrument.” Id. The board cited Bilski, Cybersource, and Dealertrack for the proposition that abstract ideas are not patent eligible and that simply adding computer aided does not make them so. Id. at 8–9. Tip: In business method context, attempt to claim explicit computer structures (data structures, data processing steps) to highlight any technical aspects of the invention. (d) resolving the primary game based on a numerical hand result of the player hand determined according to a conventional count system, wherein at least one of the side game and the primary game is a proposition game that is resolved according to a payscale. Ex Parte Webb, No. 2010-008274 (B.P.A.I. Feb. 6, 2012) at 2. Decision: Claims rejected. The “claims contain no limitations as to the mechanism for playing the game.” Id. at 5. “The claimed method does not sufficiently recite a physical instantiation.” Id. The board cited Bilski for the proposition that an abstract concept is not patent eligible and then “conclude[d] that Appellant’s claims attempt to patent and preempt an abstract idea of the game in all fields, and thus is ineligible subject matter under 35 U.S.C. § 101.” Id. Tip: A statutory claim may have been possible with more explicit steps for playing the game – this decision is questionable in that the game does require a deck of cards to play and the rules require use of the cards to play the game. providing, via the communication interface, the plurality of previews to the user system, wherein the user system provides the plurality of previews to the portable media player. Ex Parte Svendsen, No. 2011-012505 (B.P.A.I. Feb. 6, 2012) at 2. Decision: Claims allowed. The board noted the computer steps were “clearly integral to” the invention. Id. at 7. Further, the claims “recite a practical application of this core concept with computer technology (e.g., networks, user systems, user media collections, portable media players), specific method ‘steps [that] are likely to require intricate and complex computer programming’ for communications between the aforementioned computer technology structures, and, by the claims own terms, extensive use of those communications interfaces.” Id. at 6 (alterations in original). Tip: Claims reciting specific steps that use computer and other apparatus are clearly inside 101.
capturing or observing the windowing events and the file system events of the different applications or programs and using the windowing events and the file system events to automatically generate relationship information comprising relationships between the documents and/or to automatically generate importance information comprising information indicating importance of the documents. Ex Parte Pederson, No. 2009-012586 (B.P.A.I. Feb. 5, 2012) at 2. Decision: Claims rejected under 35 U.S.C. § 112, second paragraph as being indefinite. Id. at 3. The recitations of the claim “create an insoluble ambiguity” about whether it “claim[s]: (1) a physical device or software per se having (a) a single or multiple means-plus-function limitation(s) or (b) purely functional limitation(s) or (2) a machine-implemented method.” Id.at 4. “[T]the disclosed computing device includes, ‘any type of computing device, such as a workstation, a server, a handheld device, a virtualized computer, and so on.’ The computing device thus can be hardware or software (e.g., virtualized computer), and the ‘any’ descriptor does not describe with particularity the entire scope of what type of computing device (e.g., physical or virtual) is encompassed by the mean-plus-function limitation(s) and its or their equivalents. The Specification thus does not provide adequate corresponding structure or adequately identify the corresponding structure that performs the recited function(s).” Id. at 6 (citations omitted). Tip: This claim may have flown as a pure process claim, or as a more conventional computer apparatus claim. It would be advantageous if this form of claim was available, and not interpreted as a means claim.